Not to be confused with Hal Davis. In the UK, a version of "The Story of My Life" recorded by Michael Holliday reached #1 in 1958 before being replaced by Perry Como's "Magic Moments", the first time any songwriter had consecutive #1 hits in the UK charts. The duo's film work includes the Oscar-nominated title songs for "What's New Pussycat?" and "Alfie", "The Look of Love", from Casino Royale; and the Oscar-winning "Raindrops Keep Fallin' on My Head" from Butch Cassidy and the Sundance Kid. In addition, "Don't Make Me Over", "(They Long to Be) Close to You" and "Walk On By" have been inducted into the Grammy Hall of Fame. David's work with other composers includes Albert Hammond for Willie Nelson and Julio Iglesias's "To All the Girls I've Loved Before"; Sarah Vaughan's "Broken Hearted Melody", with Sherman Edwards; the 1962 Joanie Sommers hit "Johnny Get Angry" also with Edwards; and "99 Miles From L.A." with Albert Hammond, recorded by Hammond and later Art Garfunkel. With Paul Hampton, David co-wrote the country standard "Sea of Heartbreak", a hit for Don Gibson and others. David and Bacharach were awarded the 2011 Gershwin Prize for Popular Song, bestowed by the Library of Congress, the first time a songwriting team was given the honor. David was recuperating from an illness and was unable to attend the Washington D.C. presentation ceremony in May 2012. He is interred in the Forest Lawn Memorial Park (Hollywood Hills) beside his first wife, Anne, who died in 1987. ^ Padua, Pat (May 12, 2011). "Pic(s) of the Week: They Write the Songs Edition". Library of Congress - In the Muse: Performing Arts Blog. Retrieved December 4, 2013. ^ "Hal David Biography (1921-)". Filmreference.com. Retrieved 2012-09-03. ^ a b c Hoerburger, Rob (1 September 2012). "Hal David, Songwriter, Is Dead at 91". The New York Times. Retrieved 1 September 2012. ^ "Hal David, Burt Bacharach honored in D.C. with Gershwin Prize". Los Angeles Times. May 9, 2012. 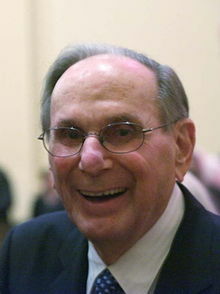 ^ "Iconic songwriter Hal David dies at 91 in Los Angeles". Fox News. Retrieved 22 September 2014. "The Fresh Air Interview: Burt Bacharach and Hal David". NPR. May 5, 2010.